I’ve been digging collard greens lately. But you get into a rut sometimes. So, I decided on a new twist on the greens. I mixed tahini with toasted sesame oil and ume plum vinegar to make a thick Asian flavored spread. I spread the sesame mix inside a taco shell, stuffed it with lightly steamed collards, and topped it with crunchy radish half-moons for more texture. I love onions. Sweet, tangy, a bit of crispness, bold flavor. I love them raw, softened a bit, or caramelized.I love that they are high in fiber, vitamin C, folate and are promising as a cancer preventer (1, 2). 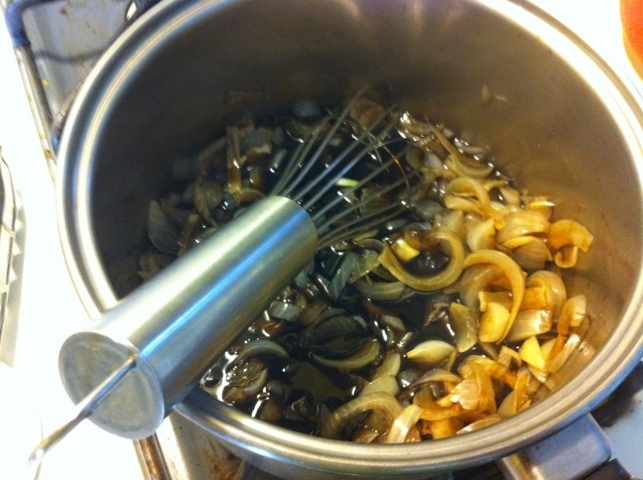 The recipe I cooked from today was from Big Vegan and called for blanching the onions for five minutes in salted water, then glazing them with a sweet vinegar sauce. Agrodolce is Italian for “sour sweet”. 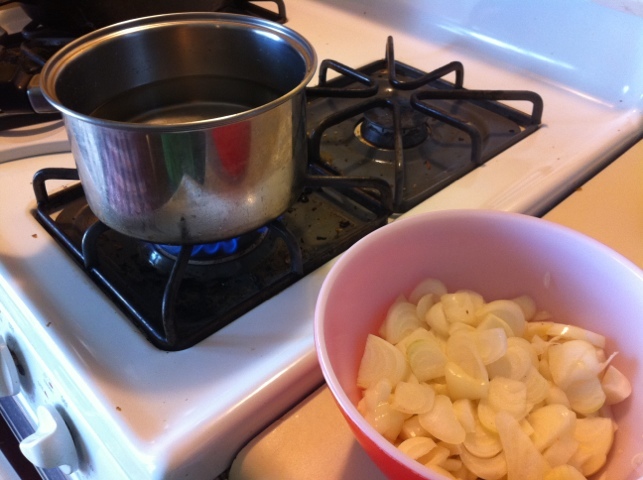 Below: Cippolini onions. These are larger cippolini onions; others are very small like pearl onions (about the size of large marbles). 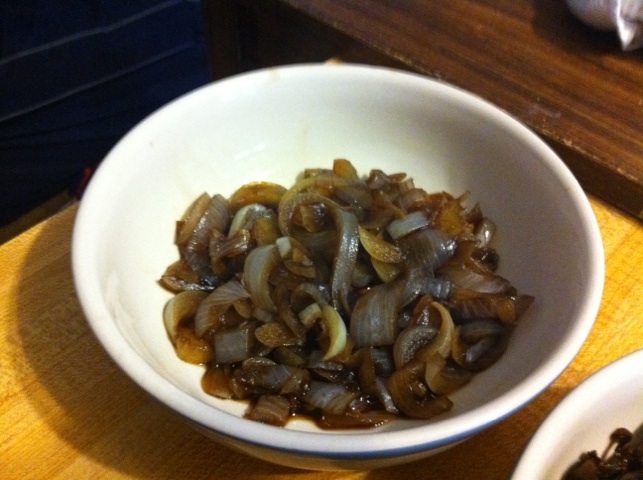 So instead of using tiny onions, which I didn’t have, I chopped the onions into medium sized pieces. 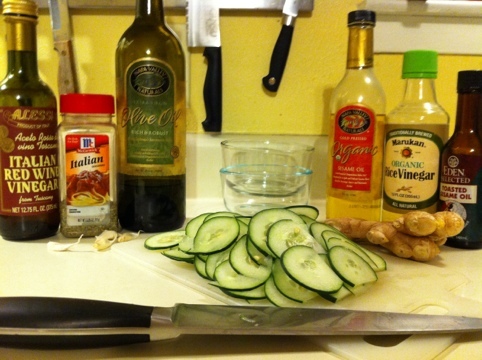 Below: The agrodolce sauce before cooking. 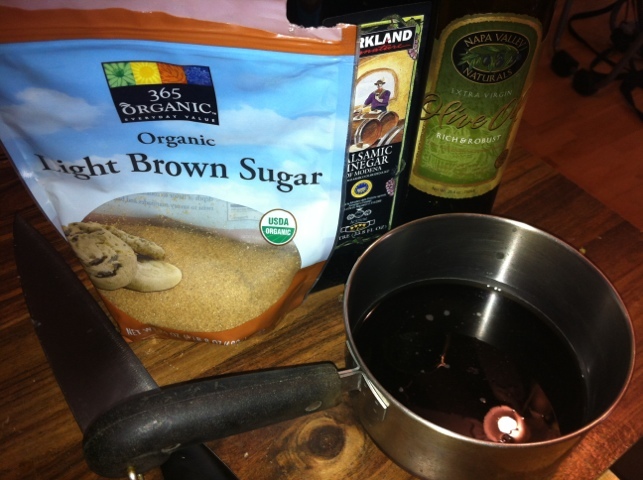 It consists of sugar, balsamic vinegar and water. 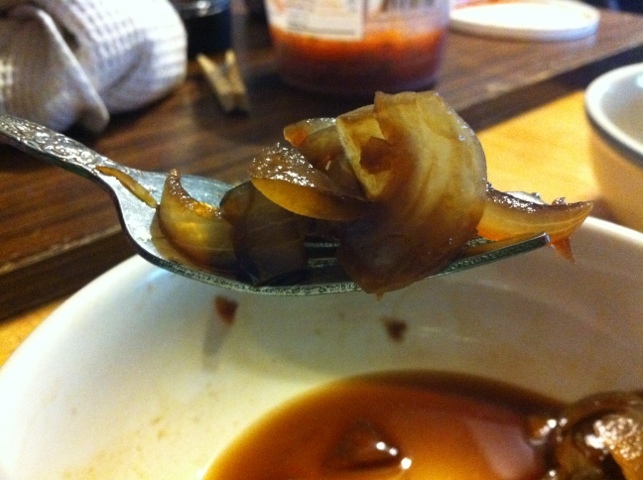 Below: The finished onion dish. It was indeed “sour sweet.” I liked the flavor a lot. The texture was just okay; I would have liked to have had the tiny cippolinis for a larger onion crunch and a bit more onion flavor. I think next time I want to try and cook down the sauce to achieve a thicker consistency. 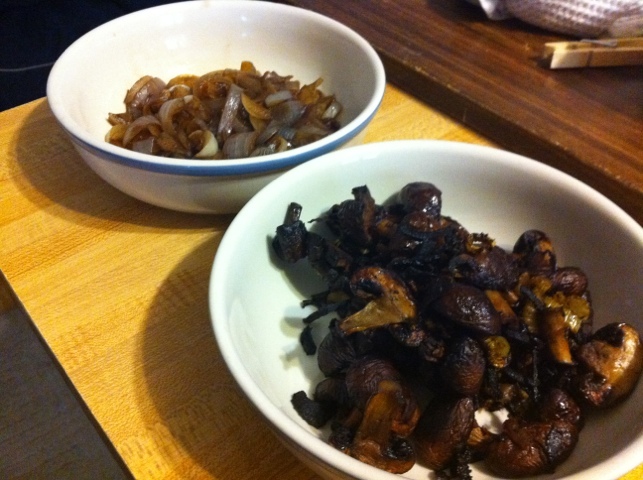 Below: I roasted crimini mushrooms – this time with celery and onion. 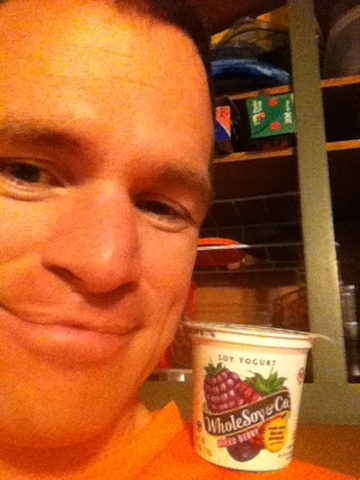 After a tough run yesterday, my body was craving something comforting and familiar. 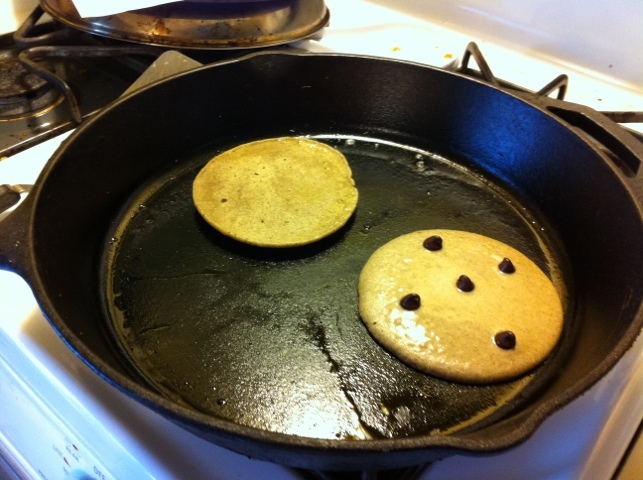 I haven’t made pancakes in quite some time – it’s been tougher since I stopped eating wheat. 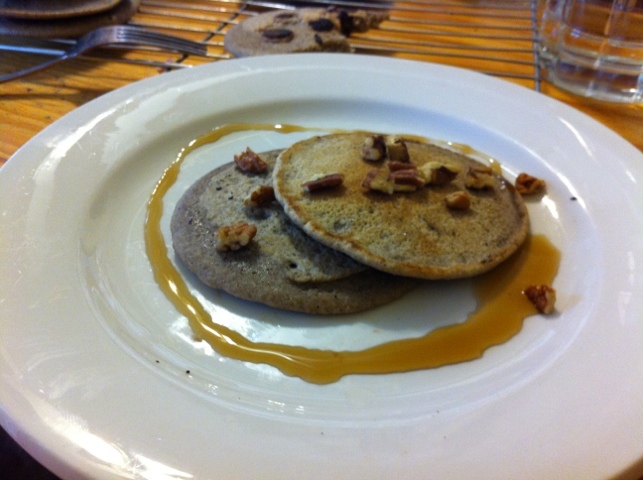 Thanks to Gluten Free ATX for the recipe and for inspiring me to get back on the pancake wagon. 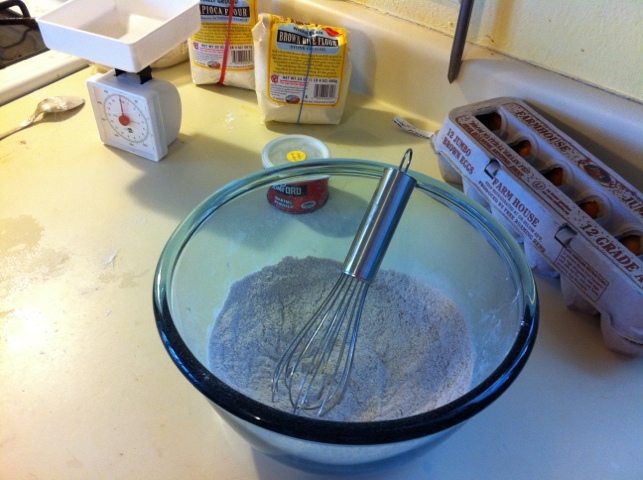 I didn’t have sorghum flour, so I used buckwheat flour. 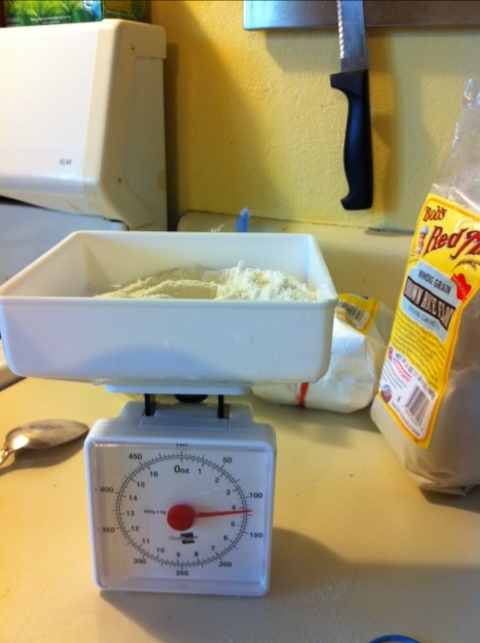 Below: First step was to weight out my dry ingredients (brown rice flour, buckwheat flour, and tapioca flour). 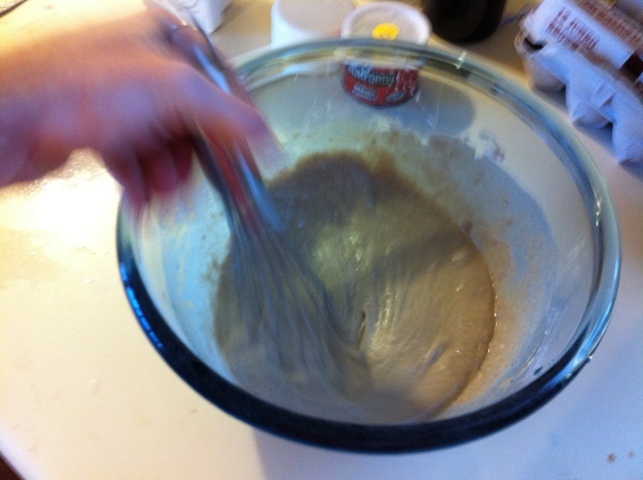 Below Photos: Blending the dry ingredients, then the wet. Below: Who took a bite from my pancake? I wasn’t me. Really. Mmm. The pancakes were great. Not something you want to do very regularly because of the highly refined grains, but very enjoyable on this post-Thanksgiving Friday. Below: A photo of a lunch from School Meals that Rock. A bit much gravy and ham, I think, but major kudos for the roasted squash, baked apple, and peas. Overall, it looks quite good. 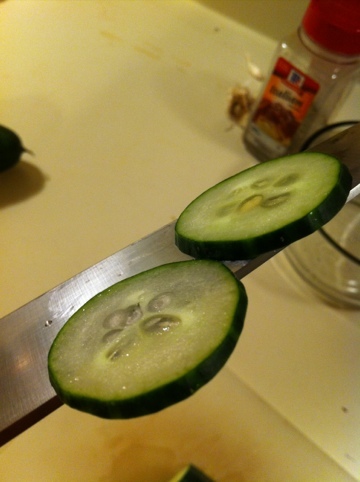 A paring knife is so handy. Peeling ginger, mincing garlic, trimming collard greens from the garden. I just love it. I picked up this little number from the Ace Mart Restaurant Supply. 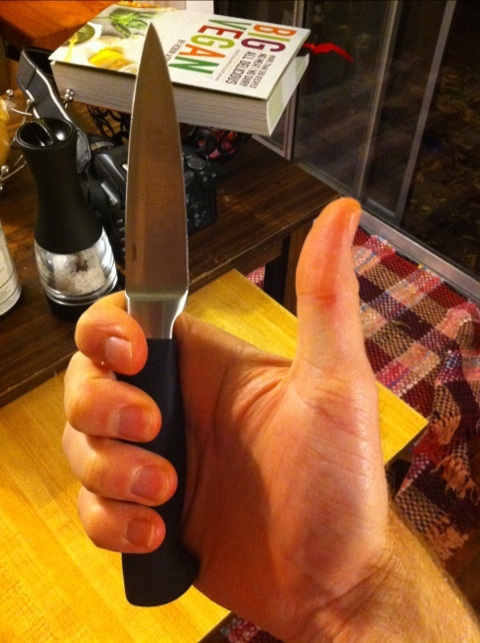 Holding a quality knife makes you feel like you can take on anything in the kitchen. 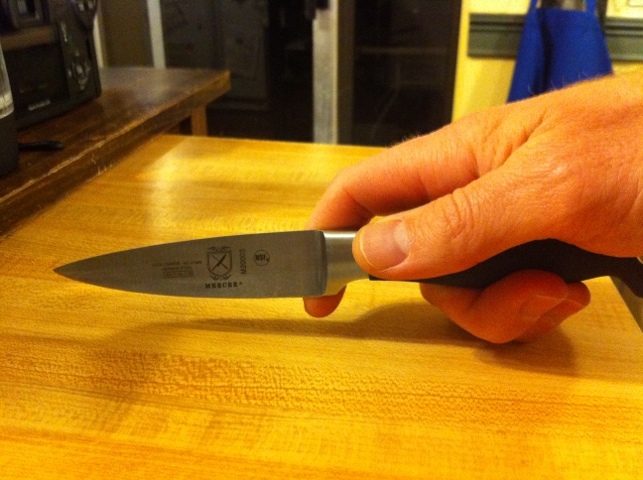 I love the heft of a good knife — it’s weight let’s me know that it will last and that it’s steel is strong. I love using a knife more than other tools in the kitchen which might be faster because it connects me with the food more. It demands of me precision and deftness. 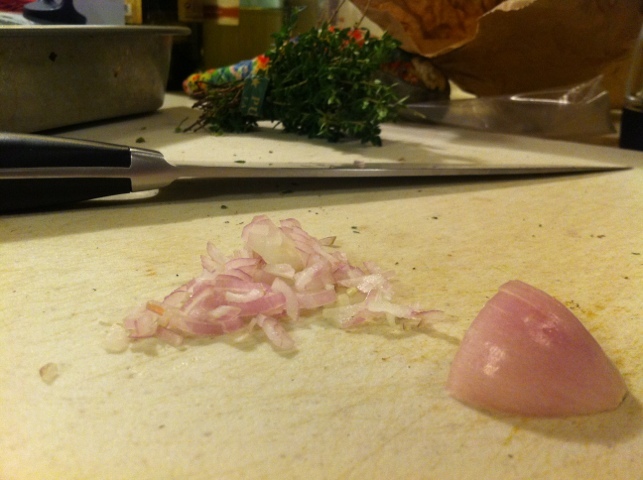 A mandoline or food processor produce more uniformity but are more utilitarian. A knife has a certain artistry; it’s the tool of a craftsman. I actually shopped around a bit for paring knives because there are two ways I hold one depending on how I’m using it. I needed a handle that offered me control regardless of how I held the knife. This one got the job because it was tall and wide enough. Others were too thin or shaped with an arc. 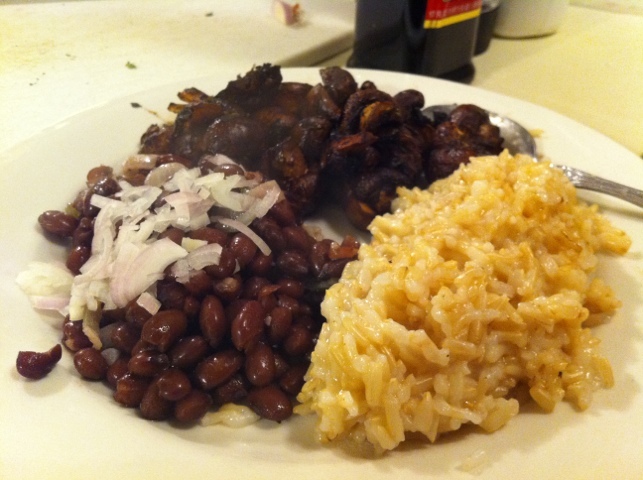 I want to eat more brown rice and beans. Both are chock full of complex carbohydrates (chains of saccharides which take longer for the body to break down and which provide a better energy source than simple carbs like table sugar). Both are great sources of fiber and contain lots of water. Beans are said to contain lots of helpful phytochemicals, compounds in plants which protect against oxidation or other inflammation-producing processes. So, I pulled out ye olde pressure cooker for the rice. The beans came from a BPA-free can. 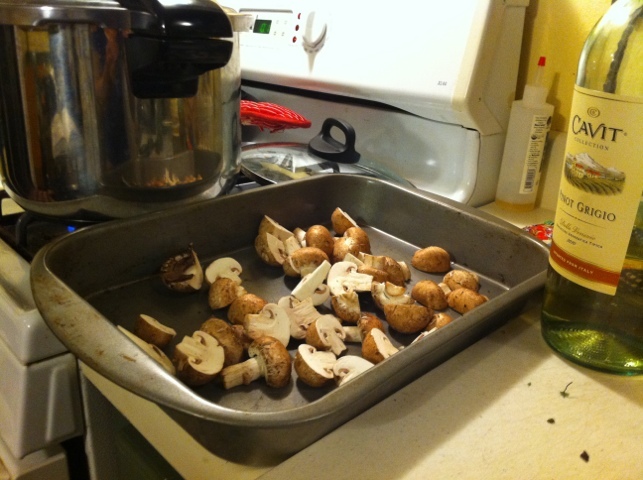 On the side, some delicious wine roasted mushrooms. 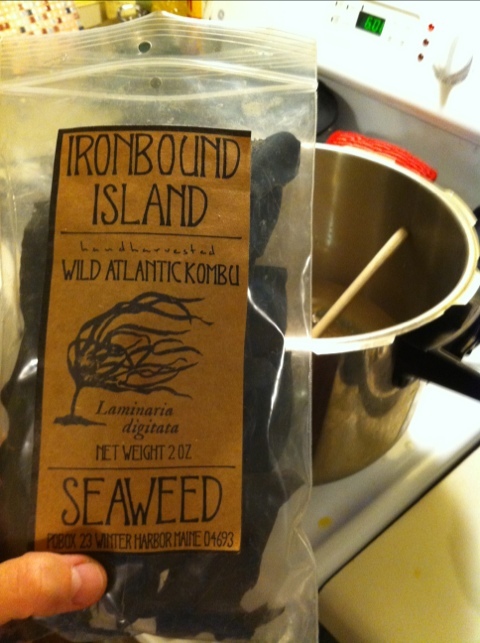 Below: I put a piece of dried kombu seaweed in the pressure cooker with the rice. It lends the rice a body and depth of flavor that you can’t achieve with rice alone. 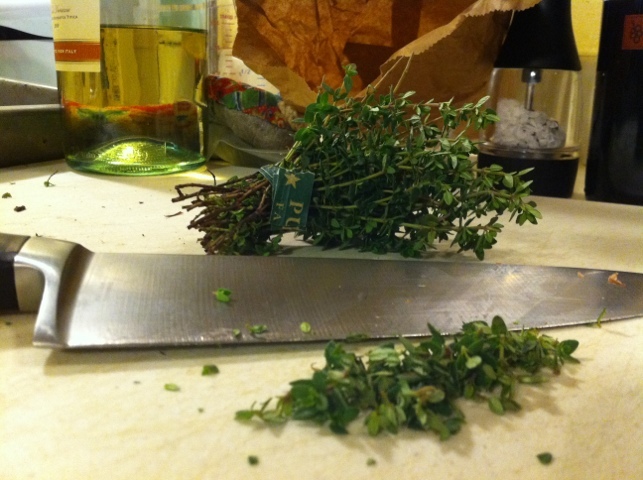 Below: Fresh thyme for the mushrooms. A plug here for Central Market: I love them! I am primarily a Wheatsville co-op shopper, but Central Market has a better mushroom selection. Plus, I love how you can get a small bunch of fresh herbs for $1.50 instead of having to buy an unnecessarily large quantity for double that price (such as at a certain publicly traded national organic food purveyor). 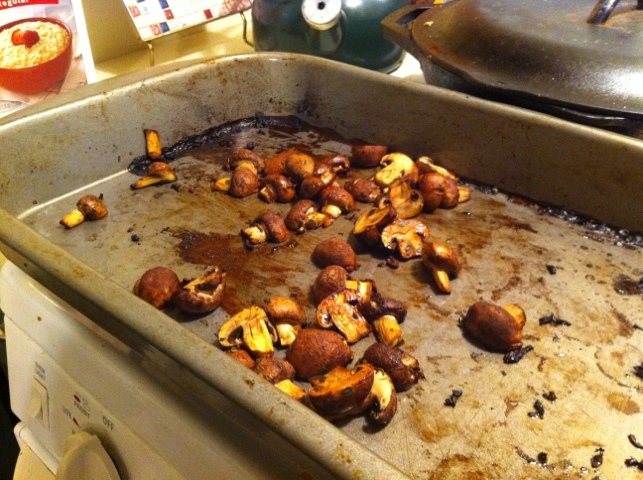 Below: Look at the caramelization of the roasted mushrooms! I deglazed it with some white wine and dissolved the glaze, creating a wonderful sauce. 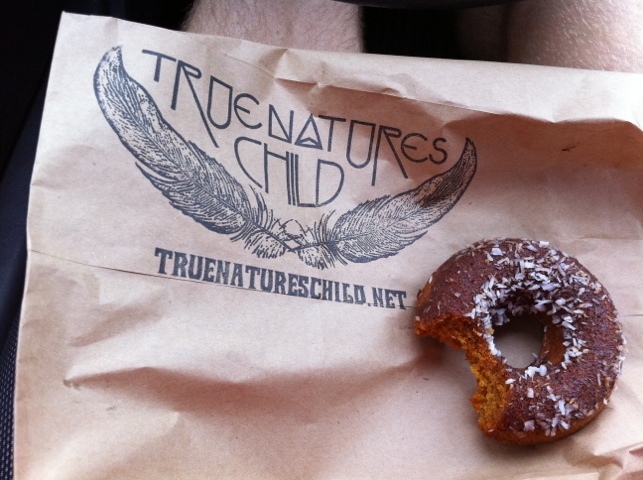 I stopped off at the downtown Austin farmer’s market and picked up a doughnut and cornbread from True Nature’s Child – yum! 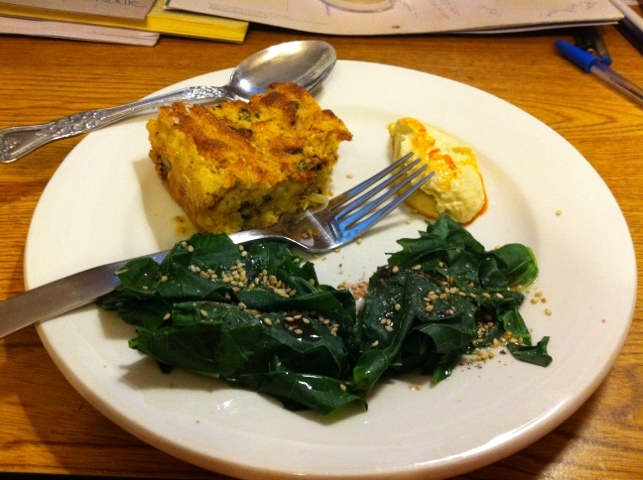 Then I proceeded to make a brunch of the cornbread, hummus (The Mediterranean Chef, also of the farmer’s market) and backyard collard greens. I used to think collard greens and all greens were foul and tasted of yard clippings. The truth is that I didn’t have much exposure to them, that I remember. 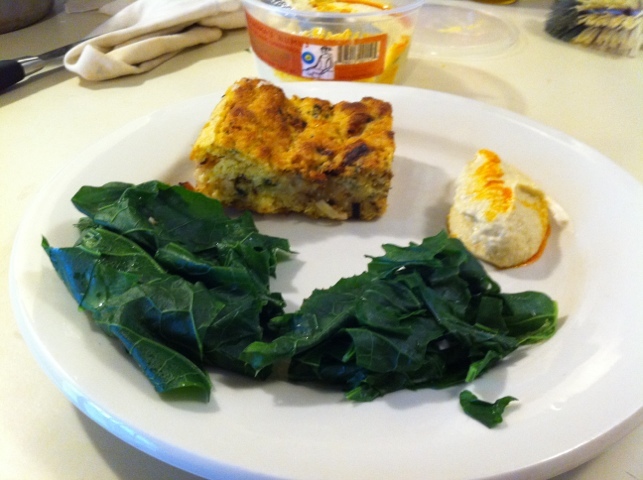 In school, they served spinach that had been boiled to oblivion with no discernible care for flavor. We used to joke that there was a strange association with spinach day and mowing of the schoolyard. Hmm. Needless to say, no one ate the spinach. But collard greens don’t taste like yard trimmings. With very little flavoring, they can transport you to another place – Asia, perhaps. Hummus is largely garbanzo beans (chickpeas). Garbanzo beans are tremendous sources of fiber, iron, and other minerals. They have a lot of protein. They are more than half water when cooked. Water is a nutrient. Your food should have water in it. Collard greens are more than 90% water. They are stocked with vitamin A and K. They are rich in folate. They provide a good source of fiber. Eating greens is like eating pure health. Greens are absolutely the best food to eat and you should eat them every single day. They will extend your life. I’ve been thinking about my deviations from the perfect diet. In full disclosure, I am not a health “nut,” I don’t eat organic vegetables all the time (or even enough vegetables). I believe in healthful eating. I believe in gradual improvements in diet. I believe in moderation and enjoying food, not in deprivation. Reframing our definition of a satisfying meal is part of this, but it also means we can still enjoy treats. A lot of so-called “treats” are not really delicious. One of my goals is to indulge in treat consumption only when it’s an item prepared with care. 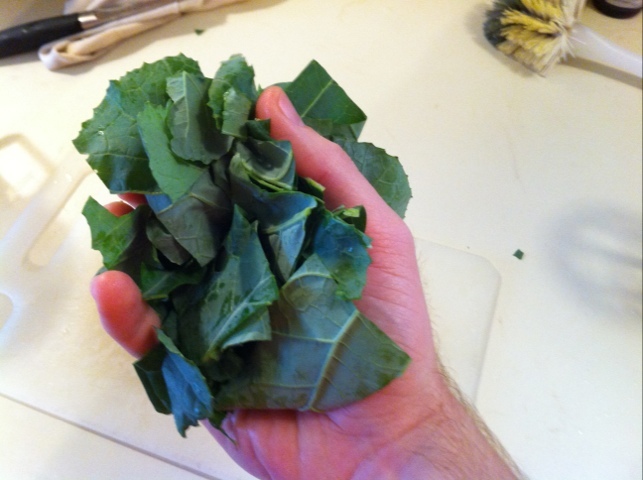 Above: A cup of raw fresh collard greens, chopped. This handful constitutes one serving (1 cup). It cooks down to about a 1/2 cup. 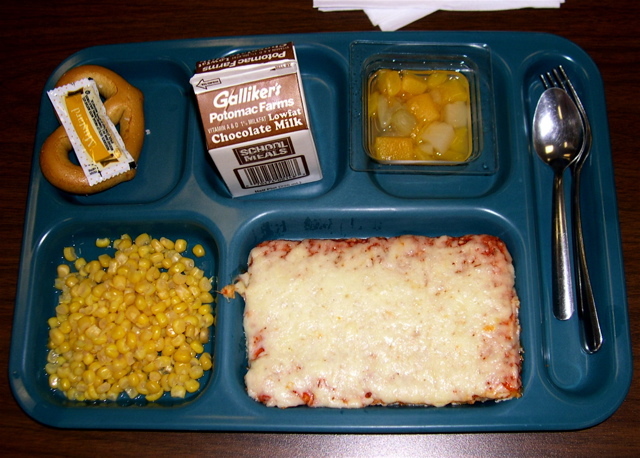 Above: Two actual servings of vegetables, as opposed to two pretend servings of vegetables, such as might be found in a school lunch pizza. I could have easily eaten twice this amount of greens (and plan to begin doing so). Above: My collard greens, rockin’ a drizzle of toasted sesame oil, ume plum vinegar, and gomasio (sesame and a bit of salt). This post is about one way we are failing our youth with respect to food, health, and life. Congress recently passed, and President Obama signed, an agriculture appropriations bill which protects pizza as a vegetable, as well as French fries. Specifically, the tomato paste on the pizza would be countable as a vegetable. Critics express that tomato paste smeared on a thick, porcelain-white slab of bread, along with deep fried potato sticks doesn’t exactly exude healthfulness. This action was part of the agriculture appropriations bill that, in part, supports the national school lunch program, a program run by the US Department of Agriculture which requires school lunches to have a certain balance of food groups and nutrients to qualify for federal funding. Some articles I read on the topic indicated the bill would put no maximum limits on vegetables and I initially thought this was a good thing. But what it really means, so far as I can tell, is that there is no limit to how much fried potato can be counted as a vegetable. So no need to steam some kale. Spinach, you keep your distance. We’re doing just fine with our fried potatoes over here, thank you. 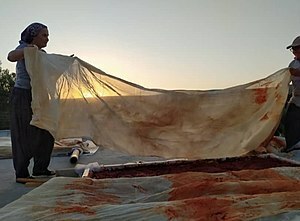 Tomato paste is a processed and refined version of a whole food — and therefore nutritionally inferior. 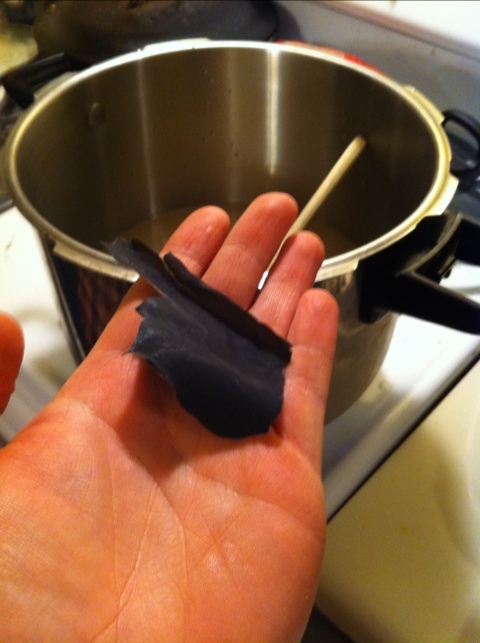 It’s heated, cooked for a long duration, and strained into a thick rich paste. How much tomato paste qualifies as a serving according to the USDA? Two tablespoons. Furthermore, pizza involves delivering this smidgen of tomato paste with a good portion of refined flour dough and fatty cheese. 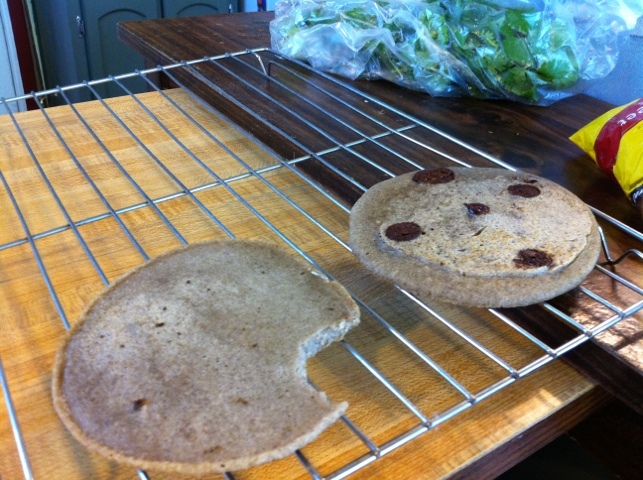 There are far better ways to deliver carbohydrates and calcium to children than pizza dough and cheese. One of the problems with refined tomato, pizza dough and cheese is they are incredibly energy dense. The fiber and water have been machined out of them. You can pack a lot more food into your mouth in a shorter amount of time when the fiber and water have been removed. Fiber helps make you feel full. Fiber helps slow the transit of food through your small intestines so they can get the most nutrients out of the food. Fiber then speeds the transit of food through the colon, which helps reduce incidence of colon cancer and enables regularity. If you want to overweight and increase your risk factors for disease, the FIRST thing I would recommend is stop eating fiber and foods with normal moisture content. Who is disproportionately more likely to get this pizza fest on a tray? School lunches are offered at lower rates (or free) to children who come from families who are barely scraping by financially. So those kids will be getting the pizza. Kids whose parents have disposable income have the freedom to choose something more nutritious. But it’s all good since their parents probably just work harder, right? These aren’t children of people who donate money to election campaigns, and their parents are probably disproportionately unrepresented at PTA meetings and in voting booths. It was remarked by one industry official that pizza can help deliver nutrients to children in a way they will actually eat. I’d like to take a look at this in another blog post, but my short response to that is that he’s taking the easy way out. I’d love to hear comments from parents and others who are more qualified on this aspect of the issue. To write to congress and express your displeasure about allowing pizza to be served as a vegetable, visit the Center for Science in the Public Interest’s website for nitfy tool to make it quick and painless. 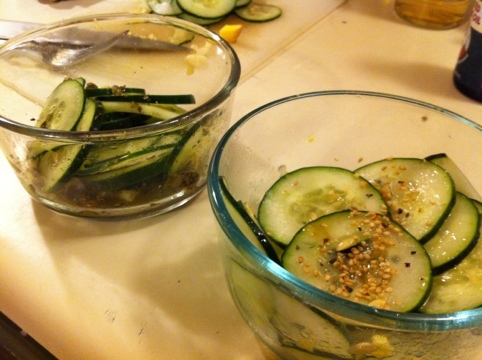 Shortly after waking, I saw a lonely looking cucumber from the local co-op on my kitchen table and got inspired to make a duo of salads — one dressed with Eastern flavors and the other with Western flavors. I love mornings! I had a nice time mincing the ginger! It’s fun trimming the skin from the ginger with conservative slices and getting such nice mincing using the tip of the knife. Ginger is such a delightful, clean flavor that is just way unappreciated in the West. 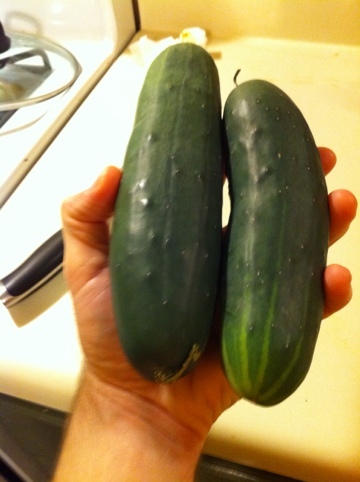 Aside from vitamin K, cucumbers are not exceptionally high in nutrients (at least not the ones commonly known and measured), but they are a great source of food with low caloric density. 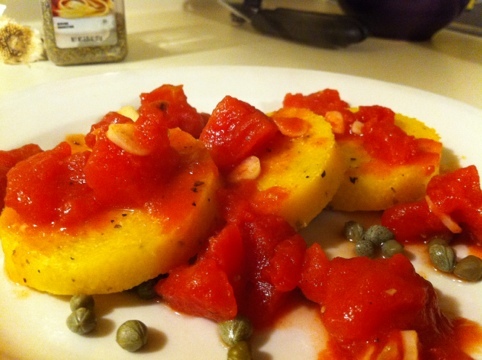 Grabbed some polenta out of the pantry for a quick dinner. 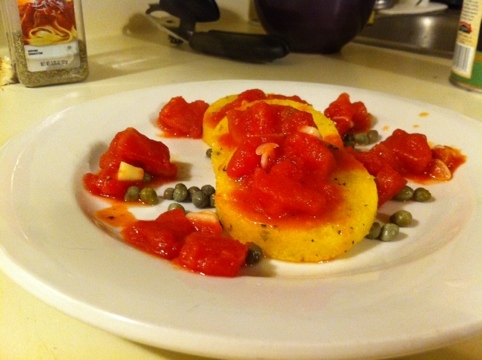 I know – aspiring chef eating prepared polenta out of a package? I’m nothing if not a food realist, and when time is tight, you need to be healthy, but also quick. 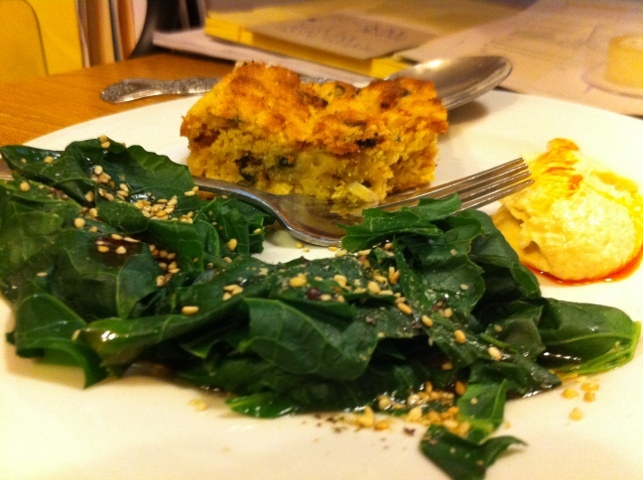 Frankly, I’m still working on how to maximize my nutrients and fit it into my schedule. It takes planning and a bit of patience. 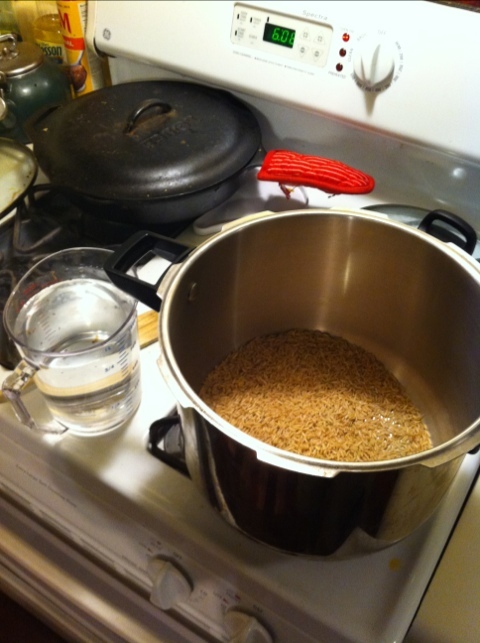 I’d like to eat more brown rice as my primary grain – I have the pressure cooker to help speed the process. I cooked up a can of Muir’s Glen diced tomatoes (America’s Test Kitchen once rated them as the best canned tomato) with some fresh garlic and olive oil as a topping. 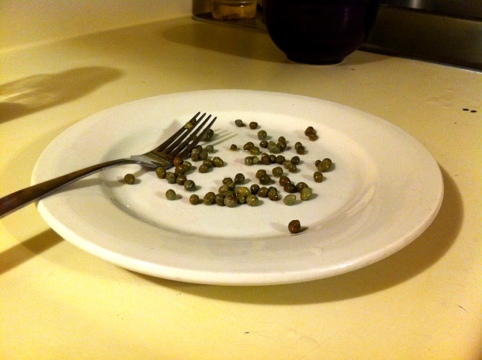 Oh, and some delicious capers on the bottom for more flavor. 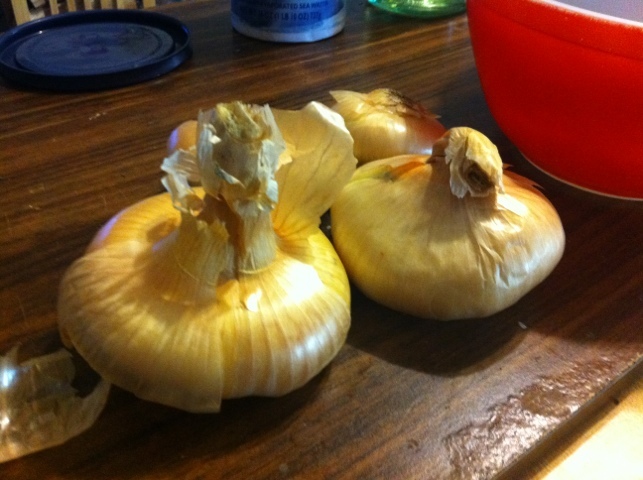 It smelled very fragrant – if you do not cook with fresh garlic let me tell you, it makes ALL the difference. Polenta is corn meal cooked with a liquid until it’s somewhere between liquid and solid. 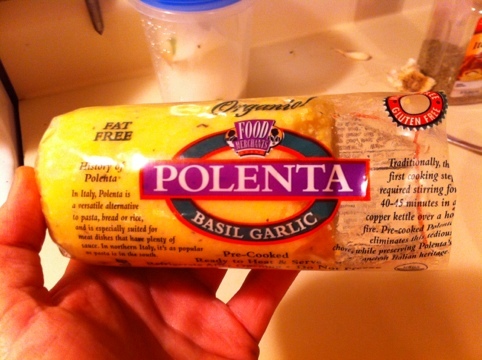 In this case, the packaged polenta is fortified with vitamins A and C (probably to help preserve it). 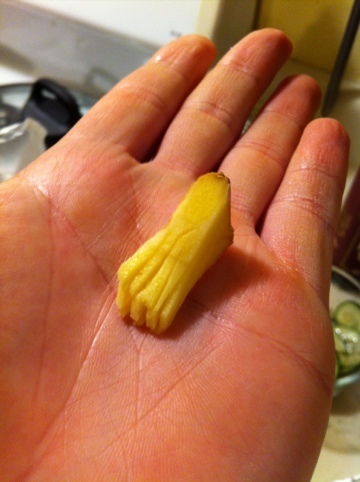 It has a toothsome texture and I like to use it instead of pasta since I can’t eat wheat (or, should I say, I prefer healthy skin to eating wheat). The tomatoes were packed with citric acid, providing more vitamin C.
The salt on this meal was far from ideal. The tomatoes packed in about 300 mg and the polenta chipped in another 600 or so. It goes to show how packaged foods are far saltier than fresh foods. In other news, the latest Nutrition Action Health Letter reports that calcium appears in the scientific research to be protective against colon cancer. 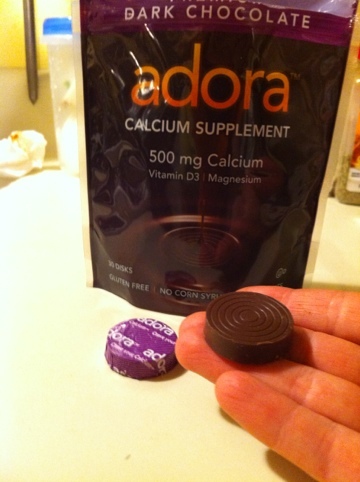 Incidentally, the 500 mg in the Adora disk is about half the calcium that most adults are recommended to eat. Luckily, there is more calcium to be had out there, and since I eat food, I am probably getting all the calcium I need.